I am sure everyone loves the Common Snowdrop (Galanthus nivalis). What a tough little plant, pushing its way up through ice or snow and continuing to flower whatever the weather. When I see those white flowers, I know winter will soon be over and the gardening season is about to take off. 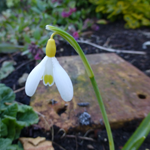 My Mum gave me my first clumps of Galanthus nivalis, which we divided and planted in the green one spring. They like my heavy soil and have multiplied happily, so I have been able to pass them on to friends, neighbours and our own children. She also gave me the double variant, Galanthus nivalis 'Flore Pleno', which came from Auntie B's (Mum's sister) garden in N Ireland. These have done equally well and have quite an impact in large clumps, particularly under the bright orange stems of the dogwood, Cornus sanguineum 'Midwinter Fire', but overall I prefer the simplicity of the single flower. Then Mum passed on some bulbs of a "special" unnamed snowdrop- a plicatus variant I think- which also settled in well. I thought that was all there was to snowdrops until about 10 years ago, when I visited an Oxford garden (sadly now gone) that specialised in snowdrops and I discovered a whole new world of subtle, and not so subtle, variations - I was hooked! 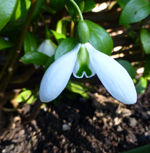 My snowdrop season starts in October with Galanthus reginae-olgae ssp. vernalis corcyrensis, which I planted in a well-drained sunny position. I am not sure that I really like seeing a snowdrop so early (or is it so late?) in the season. It looks a little odd. 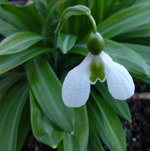 G. Mrs McNamara, an elegant tall elwesii variant named for Dylan Thomas's mother-in-law, is one of the first to appear in late December or January, along with G. Atkinsii, a vigorous tall snowdrop. I have around 50 named variants, both singles and doubles. 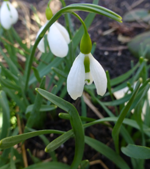 These include variants of our Common snowdrop (Galanthus nivalis), the Crimean snowdrop, (Galanthus plicatus), with distinctive pleated leaves and the Giant-flowered snowdrop, Galanthus elwesii, which originated in Turkey. Flowering times, heights, flower shape, and, above all, flower markings and colour differ. 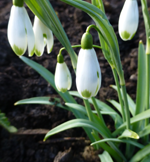 Snowdrops hybridise freely, so hundreds of distinctive named variants are available. The temptation to increase my collection may be difficult to resist.